Thousands of fans from across the nation filled Camping World Stadium on Sunday, Jan. 27 to celebrate this season’s NFL all-star players and legends during the 2019 Pro Bowl in Orlando. More than 100 players from 32 NFL teams comprised the rosters of the American Football Conference (AFC) and National Football Conference (NFC). Fans were witness to a matchup of skills between the two conferences ending with a 26-7 win for the AFC. The game was televised on ESPN, ABC and Disney XD. 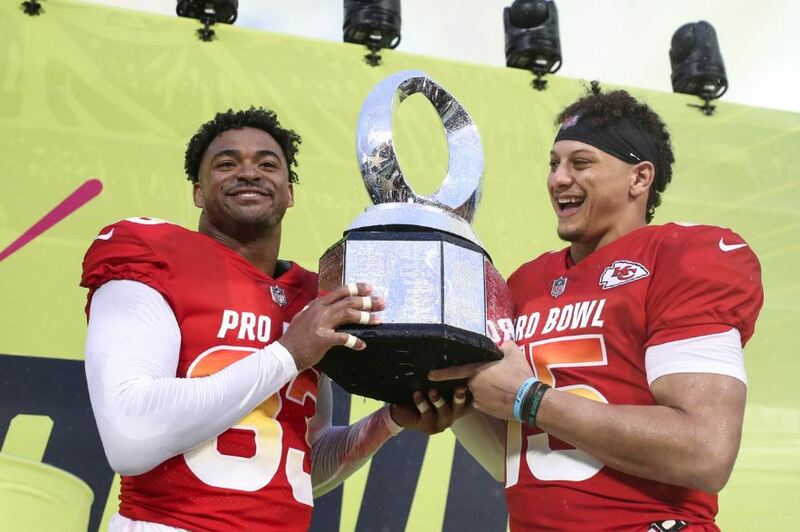 Additionally, Kansas City Chiefs’ Patrick Mahomes and New York Jets’ Jamal Adams were named the NFL Pro Bowl’s Most Valuable Players. This was the third and final year of an agreement between Orange County Government, the City of Orlando, ESPN Wide World of Sports, Florida Citrus Sports and the NFL, that the stadium would host the popular bowl game. Leading up to game day, Pro Bowl Week celebrates the host community with several events to engage fans through community service. All levels of football, from youth to high school, have the opportunity to watch their favorite players during Pro Bowl practices and skill drills and participate in exclusive clinics and family-friendly fan zones. Prior to Orlando’s three-year agreement, the last time the Pro Bowl was hosted in Florida was in 2010 in Miami. Since 2017, Pro Bowl has had an estimated economic impact of more than $120 million to the region. Photo Caption: New York Jets strong safety Jamal Adams (33) and Kansas City Chiefs quarterback Patrick Mahomes (15) pose with the trophy after being named MVP’s during the NFL Pro Bowl football game, Sunday, Jan. 27, 2019 in Orlando, Fla.